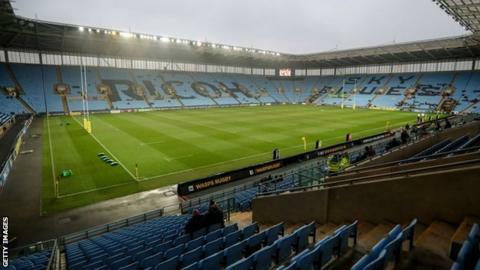 Coventry City's owners have lost their Supreme Court appeal over the sale of the Ricoh Arena to Premiership rugby side Wasps by the city council. They had asked to appeal against the decision not to allow a judicial review into the sale of the ground in 2014. City's current Ricoh contract expires at the end of the season and they are yet to satisfy the English Football League where they will play in 2019-20. Wasps have opened the door to the idea of talking again to the Sky Blues. The rugby club, City's landlords, have always said they would be ready to discuss a new deal once the legal action ended. "We have noted the Supreme Court's ruling," said Wasps chief executive Nick Eastwood. "We sincerely hope that this marks a watershed in this long-running saga. "We would urge the owners of Coventry City to take this opportunity and cease this legal action, allowing them finally to come to the table to discuss the club's future at the Ricoh Arena - something all parties are keen to see happen." The legal case, heard under the title of Sky Blue Sports & Leisure Ltd and others v Coventry City Council, also involved companies under the Sisu banner, including Otium Entertainment. In a joint statement, Coventry City Council leader George Duggins and Gary Ridley, leader of the opposition Conservative group, said: "We are delighted with the judgment from the highest court in the land which once again justifies why we have robustly defended all claims brought by Sisu-related companies over recent years. "Sisu has continually sought to re-open decisions taken by the council almost five years ago but we have always remained steadfast in our belief that those decisions were appropriate, lawful and in the best interests of Coventry tax payers. "We hope that this will be the last stage of the litigation and that Sisu will accept this as the end of all legal action so that further unnecessary costs are avoided for all parties involved. "The continuing litigation is achieving nothing apart from alienating them from the partners in the city who they should be working with to secure a successful and sustainable future for Coventry City FC here in this city." City's owners are yet to make a comment on the Supreme Court ruling, which said "Permission to appeal in this case has been refused because the case does not raise an arguable point of law of general public importance." The legal case hinged on their claim that Coventry City Council undervalued the Ricoh by £28m when the ground was sold to Wasps. Sisu have attempted to force the matter to a conclusion as the deadline approaches to inform the EFL where the League One promotion outsiders intend to play their home games next season. At their board meeting on 2 April, the EFL confirmed that all member clubs had been notified about an Extraordinary General Meeting, to take place on 25 April, at which Coventry would face expulsion from the league if they had not by then announced a new deal. The club have identified the former Woodlands School site in the city as one potential long-term option for building a new stadium. In the meantime, various reports have linked Birmingham City, Burton Albion, Nuneaton Borough and Coventry Rugby Football Club's Butts Park Arena as all potential groundshare hosts for the Sky Blues. But the preferred option is that the club, who are eighth in the table, and eight points off a play-off place with four games left, will remain at the Ricoh. Apart from their ground-sharing deal with Northampton Town in 2013-14 at Sixfields, 33 miles away, the Ricoh has been City's home since leaving Highfield Road in 2005.